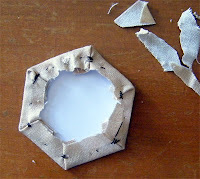 Rambling around my Life: Hexagon Flowers and my way of making them. Hexagon Flowers and my way of making them. 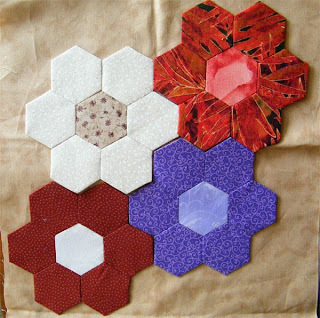 I have just joined a group where I will swap a hexagon flower with another member each month. This way I will get the benefit of fabrics which are different to the ones I already have, and I'll also benefit from other people's perception of colours which work well together. This will add variety to my future hexagon flower quilt, a garden of flowers. These are the first four flowers I have made and one of these flowers will be heading off to a new owner tomorrow. It is quite some time since I have done one of these so at first I was getting in rather a muddle. I read several ways that other people construct the hexagons but paper clips and clothes pegs kept snagging and knotting my thread. In the end it was trial and error that developed the following method which works for me. To make a hexagon with 1" sides, cut a 2 3/4" square and snip off the corners. 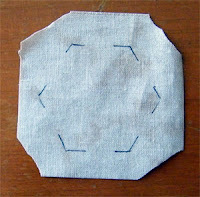 With wrong side facing you, lay the hexagon template in the centre of the fabric and mark the position of the corners. Remove the card. Start a tacking thread with a tiny stitch (see my knot in the top left hand corner) about 1/8" outside the line of the marked hexagon. 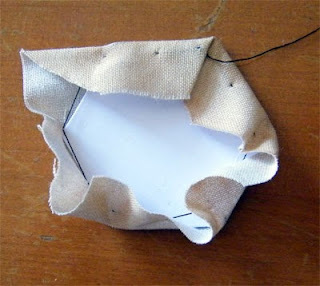 Working anticlockwise take tiny stitches in the centre of each side and at each corner. Take your final stitch at the corner where you started, then take another tiny running stitch to take the thread through onto the right side of the fabric. 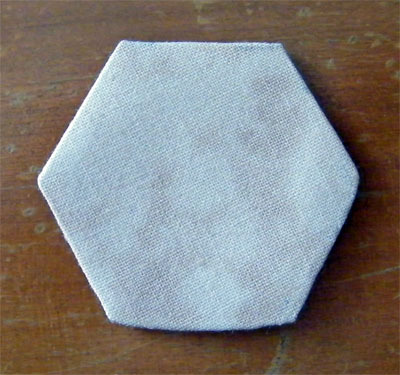 Place the hexagon card back in position and gently gather the fabric on the thread, so holding the card in place. Keep gathering until you have nice crsip edges where the fabric comes over the card. 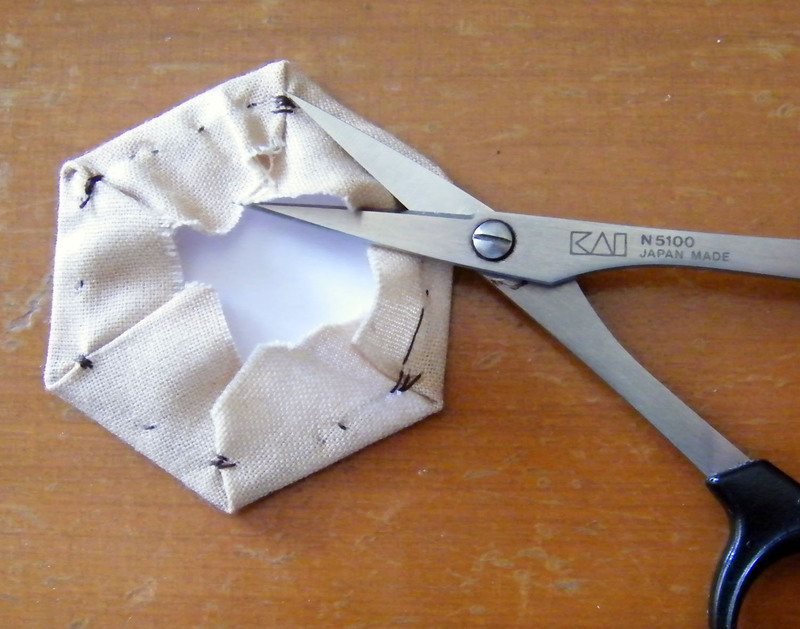 Your card will now stay nicely in place while you stitch the corners. 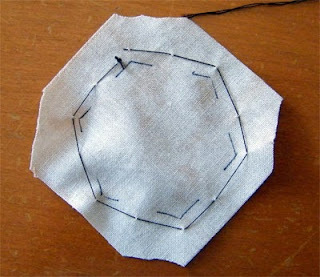 Starting at the same corner as your thread make your corner in the usual way with a crease then a fold and stitch the fold down with two or three stitches. 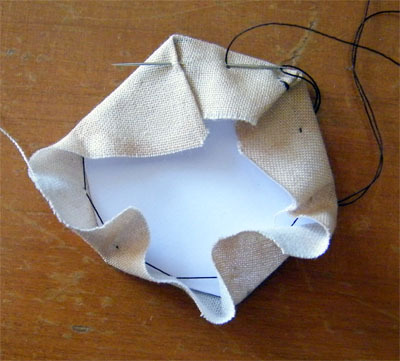 Slip the thread under the fabric, take a small back stitch about half way along the side then repeat the crease and fold on the second corner. Continue in this way until all corners are done. 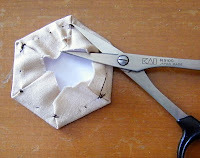 Use a small pair of sharp pointed scissors to carefully trim the seam allowance to about 1/4". 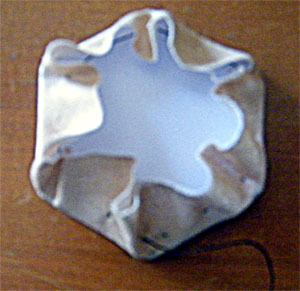 Now to find some fabric to make petals to suit this centre. I love your hexies! I had a lot of fun making mine, now I need to come up with a plan and make more. They are so easy to do it front of the TV. Barbara, would you be able to post your method of basting hexies on the Inchy Swap Blog. I am sure the other members would love to see it.